Ernie Rogers, 84, of Syracuse passed away on March 11, 2018 at his home. He was born on March 16, 1933 in Syracuse to Lewis & Frances (Davis) Rogers. On August 8, 1954 he married Julie Logan who preceded him on April 29, 2017. He was a lifelong area resident. He owner and operated Logan-Rogers Realty. 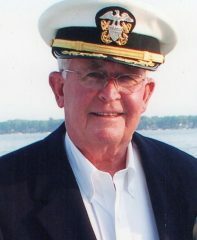 He was the Wawasee Flotilla Commodore in 2007. He served on the Flotilla committee over 30 years, he also organized the Flotilla Road Race. He was a member of the Milford Masonic Lodge, Calvary United Methodist Church, S.A.L Post 253 North Webster. He served on the Kosciusko County Board of Realtors for 40 years. He also served on numerous committee’s over the years for the town of Syracuse. He is survived by his daughter – Shelly Rogers (husband Terry Stump), Son – Scott Rogers. 1 granddaughter, 1 great-granddaughter. He was preceded by wife Julie, daughter Stacy List, son in law Dan List. 1 brother, 1 sister as well as his parents. A Celebration of Life will be held in Ernie’s honor on Sunday, April 29, 2018 at 4 pm at the Owl’s Nest in North Webster with Pastor Brad Cox officiating. Social hour will be from 2-4 pm, and after the service until 6pm. Memorial contributions may be made to New Hope Pet Rescue. Eastlund Funeral Home is handling arrangements.